For over 30 years, tobacco shop owners and managers - those responsible for buying and stocking merchandise - have come to trust the industry's most objective and widely distributed editorial voice: Smokeshop magazine. Our editorial strength and longevity in the industry delivers an unbeatable platform for successfully promoting your merchandise and services to the industry's retail segment. As a Smokeshop advertiser, you'll profit from the most established and respected magazine in the industry. Promote your products and services to North America's most influential retail merchandise decision-makers with a comprehensive advertising program in the industry's trade magazine circulation leader. Every feature story is designed to help retailers operate a successful business, while providing exposure to manufacturer's products. Special reports on merchandise categories present retailers with compelling reasons to stock specific types of merchandise, while offering advice and testimonials from fellow retailers and source guides of manufacturers and retailers for ordering merchandise. Smokeshop helps tobacco retailers operate more effectively, providing merchandising ideas, manufacturing reports, trends, promotion ideas, how-to store operation plans, and much more. Published six times annually, Smokeshop keeps retailers informed about all pertinent aspects of the tobacco industry, from the merchandising of cigars, specialty and luxury cigarettes, pipes, tobaccos, and accessories to the latest trends and changes affecting small, independent shops and large, multi-unit chains alike. How-to features instruct store owners and managers on a variety of subjects designed to keep their business profitable, their customers happy, and their operations running smoothly. Only Smokeshop gives every tobacco retailer a free website listing on our Internet database of smoke shops, The Smokeshop Finder. Advertisers also receive free listings in our Tobacco Industry Buyer's Guide, featured exclusively on our website - Smokeshop Online - which offers numerous services to our subscribers and thousands of additional potential merchandise buyers to our magazine advertisers. Additional online advertising opportunities are also available, including low-cost website development and maintenance. The Smokeshop reader stocks a wide variety of quality merchandise. 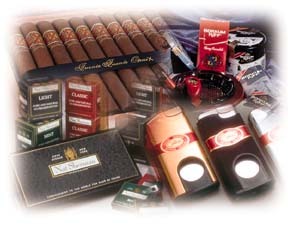 Whether you're a manufacturer or distributor, you can reach wholesale buyers of cigars, mass market and specialty cigarettes, herbal and tobacco-free cigarettes, pipes, pipe tobaccos, roll-your-own tobaccos, smokeless products, smoking accessories including humidors, cases, cutters, lighters, cigar-themed merchandise, books on cigars and pipes, fine writing instruments and other men's gifts. In fact, if the demographic for your product matches that of an established tobacco shop, Smokeshop will deliver the audience. Authoritative Features: Profiles of successful, independent and corporate-owned retailers; distributor and manufacturer spotlights; industry trend updates; authoritative production reports; and how-to primers. Retailing News: Trends and newsmakers in tobacco retailing; hot button issues that affect tobacco shops. Industry News: Breaking industry news, legislation, and updates on suppliers, distributors/wholesalers, and manufacturers. Retail Tools: Point-of-sale and other store equipment, walk-in humidors, services and products crucial in running a retail business. Pipe Update: News and product introductions focused exclusively on pipes and pipe tobaccos, and the companies that provide them. Brand News: Cigars, cigarettes, RYO, and specialty tobaccos: new products, line extensions, marketing promotions, distribution news. Product Showcase: Smoking accessories, fine gifts, and general interest merchandise items. For information on Banner Advertising at SMOKE or SMOKESHOP's web sites, contact us at sales@smokeshopmag.com. SmokeShop Magazine is published monthly by Lockwood Publications, Inc., 3743 Crescent St., 2nd Floor, Long Island City, NY 11101 U.S.A., Tel: (212) 391-2060. Fax: (1)(212) 827-0945. HTML production and Copyright © 2000 - 2013 by Keys Technologies and SmokeShop Magazine.